It is said that the most difficult thing you will ever have to do is to say goodbye to someone you love or care for. However, as Muslims we accept the ultimate and submit to the WILL of ALLAH, our Creator, with patience. We pray for mercy and forgiveness for the deceased. The Islamic Centre of Cambridge has been serving the community for many years to provide funeral services. 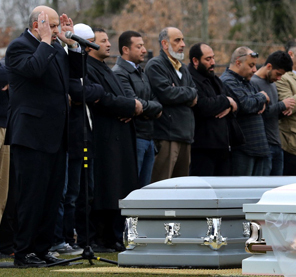 Funeral Services Department of the Islamic Centre of Cambridge has the facilities and a team of experienced and caring volunteers to assist you with the funeral arrangements. The Funeral Services Department has a well-equipped room to give ghusal (bathing), and to prepare the body for burial. There is also a refrigerated room for the storage of a body. Supplies needed in the Preparation Room are stocked. Volunteers (brothers and/or sisters) are available to give the ghusal and prepare the body, when needed. What is Available and Provided? The Salatul Janaza is performed in the Banquet Hall ‘B’ downstairs. There are separate prayer areas for men and women. Non-Muslim friends are welcome in the mosque as well as in the Banquet Hall ‘B’ for funeral services. Proper dress code is expected. The ICC has reserved a number of plots for Muslim burial at New HopeCemetery in Cambridge. The purchasing of the grave plot and making necessary arrangements can be completed by contacting our office at 519-740-6855 during the office hours 8:00 am to 4:00 pm Monday through Friday or Mr. Mohammad Darr at his Cell #519-651-9597. ICC has reserved many plots in a dedicated section of the New Hope Cemetery. The ICC has purchased quite a few burial plots in that section. This arrangement with the City of Cambridge has been in existence for more than 20 years. Religious burials and services are done according to Islamic rituals (sharia). In Case, you are in need of Funeral and Burial services of the Islamic Centre of Cambridge for your loved ones, please contact the ICC at 519-740-6855 anytime during the day or night and leave a message. Someone will respond to you soon after your call. The ICC is working on a project of All Muslim Cemetery. It is planning to establish and maintain All Muslim Cemetery. It will be a religious cemetery exclusively dedicated to Muslims. In a Muslim cemetery our identity will be preserved for our community, and for our children and children of children down the line. It is more likely that our families and friends will visit us in the future in a Muslim cemetery, where they can find their roots and be proud of them. Our graves, in an exclusively Muslim cemetery, will be a source of strength for them and a reminder of their cultural heritage. The ICC strongly believes that the acquisition of this facility will serve as an important regional anchor for our religious community. In creating a place of permanent rest dedicated exclusively for Muslims, the identity of Muslims in the Waterloo and Wellington region will be sustained. What should anyone do if the need arises? Call the Islamic Centre of Cambridge at 519-740-6855 Ext 300 at any time. You will be directed to the Funeral Services Department. If there is no answer on this number, please call Mr. Darr at 519-651-9597 (Cell) for or Mr. Malik at 519-623-9992 (Home). Office staff during the regular hours or one of the volunteers after hours will then take care of all the related details and services. A member of the family will be asked to come to the office to meet with a staff member/volunteer and provide information about the deceased and the family. The information session takes time and your presence in the office may be necessary. We, therefore, suggest that the office be contacted in advance in instance where death is imminent.